Cinematcher is a matchmaking app for film, T.V. and digital jobs and events. 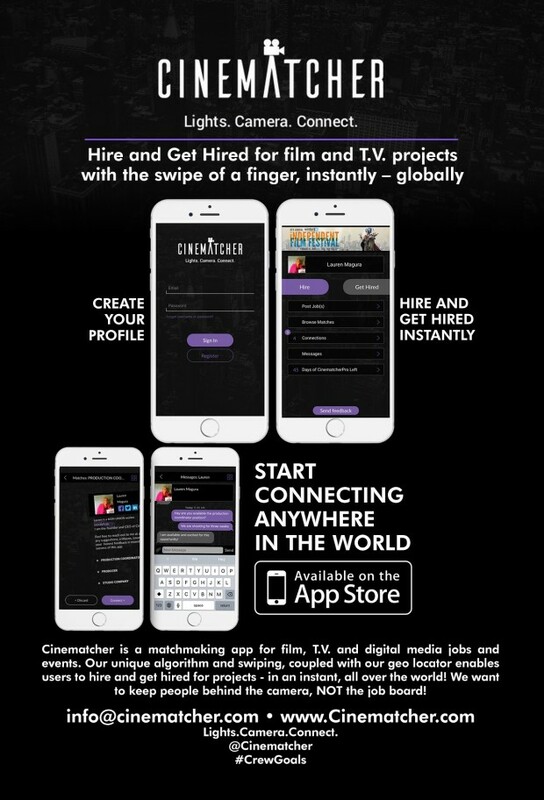 Cinematcher enables users to hire and get hired for film, T.V. and digital projects using geo location, instantly - anywhere in the world. We want to keep people behind the camera, NOT the job board. Our founder being a woman, we strongly support and encourage diversity within the industry and as our user base. Users have the choice to identify as a diverse individual or owned company. Our app then allows users to filter their matches as any or all of the chosen diversity titles. Cinematcher applies to every member of a film or television production. Our users have been calling Cinematcher the 'Tinder' for film and T.V. jobs. We provide on demand crew connections for films, shows, businesses, individuals, etc. 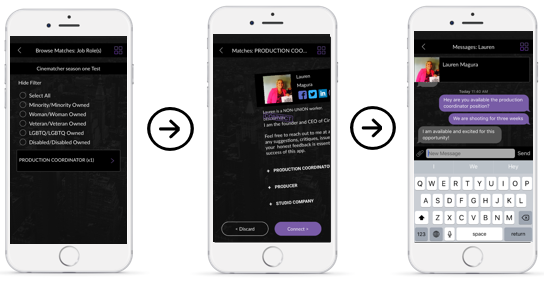 The app is an essential tool for anyone working on any project from Hollywood films, to commercials, to a small business promo video, to a web series and everything in-between. Our matchmaking algorithm includes an extensive job titles list ranging from Key Creative users, to freelancers, to film catering companies, to PR reps, to students, to name a few. Cinematcher will be a one-stop shop, for everything production. Users have the option to “Hire” and “Get Hired” simultaneously, categorizing their matches and connections for each. The Geo Locator uses the GPS on users’ phones to connect crew members and projects based on location. “Quick Connect” matches projects and production crew members instantly. Users have the option to connect their profile to IMDb, YouTube, personal website, LinkedIn, Facebook, and Twitter accounts for one digital profile. Being in the film industry, we saw the massive disconnect between professionals that want to hire and get hired. The process is lengthy, costly, and has little to no return based off of the demand of individuals trying to break in. The industry is a huge Word-of-mouth community, which makes it sometimes impossible to find talent, or projects if you do not already have industry contacts or an 'in' anywhere. Cinematcher is hoping to become that 'in' for ANYONE who is passionate in joining the industry. We understand the urgency and need to get things done in an instant. When paying for a location and set, even a few minutes can add up to more money. Having something on your phone that enables you to work instantly, while still on set in ANY location, can revolutionize the entire industry! Our process provides instant results so people can focus on their work and creative process instead of spending hours sifting through irrelevant job posts. We also understand that the crew members are constantly traveling from city to city, and do not always have stable gigs lined up. Our app will not only enable you to get steadier work, but instant work even if you are just passing through a city on your way home from a shooting another project. We understand the creative minds, and most importantly, the passion and WANT, to be able to work on projects no matter what city they are in, or how much time they will be in that area. Our goal is to provide a more stable and instant way of finding and creating work, in a not so stable industry. We also want to encourage the hiring of local crew members with our GPS based matches. We know there are local talented crew members that can be used for these productions, they just need the right tool so they can be found. We also aim to open a digital door for people who may not know how to break in. Content creation is massively increasing. Non traditional distribution channels such as Netflix, Hulu, Amazon, etc are creating more content which means an increase in productions, and an increase in less traditional shooting areas. New tax incentives and local business benefits are encouraging more productions outside of Hollywood. There needs to be a tool that allows ANY one from ANY background in ANY location to connect for projects easily and instantly. We use this technology for dating, driving, ordering food, socializing etc. Its time our industry starts taking advantage of that same technology. We have gotten hundreds of e-mails from Android users, and we want to work on getting Android launched ASAP. We are also in need of additional funding to help roll out features, and make the user experience and design of the app the best it can be. Unfortunately development is expensive! We want our app to benefit everyone within the industry, so gaining real feedback, and developing and refining features to fulfill that feedback is so important to us. So please help us open a digital door to simplify hiring and getting hired within the Film and TV industry. Every bit counts in helping us reach our goal. We are freelancers, so we understand times are tough! If you can't contribute, please join our journey by spreading the word to anyone in the industry in all geographic areas by sharing our campaign and/or our app link. YOU, are what will make Cinematcher a success. The more users we have on the app the better the matches and connections will be for you! For a $10 contribution, you will receive 1 annual Cinematcher subscription at this exclusive 90% Seed&Spark discount. Please note we are currently iOS, but are hoping to launch Android soon! The first 20 donors will get a pair of tickets to any evening screening of their choice (Mon-Thursday) at the Winter Film Awards 2018 Indie Film Festival in NYC, Become part of the Cinematcher crew by receiving 1 annual Cinematcher subscription at this exclusive 90% Seed&Spark discount. Please note we are currently iOS, but are hoping to launch Android shortly. For a $50 contribution, you will receive 1 annual Cinematcher subscription at this exclusive Seed&Spark discount once we launch . Please note we are currently iOS, but are hoping to launch Android shortly. You also will receive a 10% discount on RushTera subscription for 2 months (digital file sharing service for your project/s). 1 Annual subscription to Cinematcher (iOS only right now), 10% off RushTera subscription for 2 months (digital filing sharing service for your project/s), Headshots for your profile or social pages in NYC or NJ, Social media shout out of you and/or a project you are working on. First 10 donors will get ONE submission fee waived to enter their project in the Winter Film Awards 2018 Indie Film Festival in NYC, 1 Annual subscription (iOS only right now), 20% off RushTera subscription for 3 months (digital filing sharing service for your project/s), Social media shout out of you and/or a project you are working on, E-mail blast shout out to our community of a project you are working on, Custom Cinematcher #CrewGoals t-shirt, Custom Cinematcher sunglasses. 1 Annual Cinematcher subscription (iOS only right now), 20% off RushTera subscription for 3 months (digital file sharing for your project/s), Social media and e-mail blast shout out on of you and/or a project you are working on, Custom Cinematcher #CrewGoals t-shirt, custom Cinematcher sunglasses, Marketing tips/ideas and personalized press release for a project you are working on by an experienced major studio film marketing professional. First 5 donors will receive 6 Universal Pictures ADVANCED screening invites in NYC, 1 Annual Cinematcher subscription (iOS only right now) , 30% off RushTera show or studio subscription for 4 months (digital filing sharing service),Custom Cinematcher #CrewGoals t-shirt , custom Cinematcher sunglasses, Headshots in NYC or NJ, Marketing tips/ideas and personalized press release for a project you are working on by an experienced major studio film marketing professional. An invite to any Cinematcher shoots to meet the creative team. We are in need of additional funding to enhance features, the design and overall user experience of the app. This will support any additional operating costs. Lauren Magura is the Founder and CEO. She came up with the idea of Cinematcher through her passion for connecting people. Lauren has a background from NBC in the media operations center and Universal Pictures in marketing and film.The true dedication of everyone in the industry, and the need for a simpler and quicker hiring process influenced Lauren to put Cinematcher into motion. You're now following Cinematcher - Lights.Camera.Connect. ! Hungry for more great companys? Try our streaming subscription!